A home rented by Evan Longoria and three other Tampa Bay Rays teammates for spring training was robbed this weekend. Longoria, David Price and Reid Brignac had over $50,000 of personal items stolen from their rented home while the team played a game at Charlotte Sports Park. ”They took pretty much everything that was ours inside the house,” Longoria said. Among the stolen items include: Xboxs, iPads, watches, laptops and Longoria’s AK-47. The fact that Longoria had a gun in the home of his spring training camp residence has raised some eyebrows amoung Rays fans, but according to the sherrif investigating the case, the gun is perfectly legal. Longoria was a victim of theft earlier in spring training when his 1967 Camaro was stolen from an autobody shop in Arizona. Police do not think the crimes are related. And I thought stealing was encouraged in baseball?!? The Tampa Bay Rays clinched the AL east and celebrated by making a makeshift slip ‘n slide out of a plastic tarp and champagne in their clubhouse at Kauffman Stadium. This is the Rays third AL East title in three seasons. Tampa Bay clinched the division on Sunday and will play the Texas Rangers in the opening round of the playoffs. Despite the Rays division title, the Minnesota Twins are the favorite to come out of the American League. The Twins face a tough opponent in the defending champions New York Yankees. Tampa Bay Rays Manager, Joe Maddon introduced a hot new look in the bullpen. 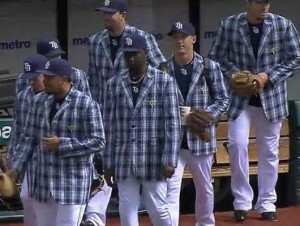 The Rays will all wear matching plaid blazer for their west cost road trip, which Maddon nickednamed “bRAYSers” Maddon created a new team policy that all team personnel must work the word Rays into as many puns as possible. It must be working, since the Rays are in first place!